Racing is held most Sundays during the season between April and October. We generally have several F18 catamarans and a few Dart 16 catamarans, but with regular appearances from Fevas, Vagos, 420s, 29ers, Mirrors, an Otter and some Toppers. All types of sailing dinghies and cats are welcome! Our junior and youth squad sailors join us when not representing the club at national Topper and 29er events. 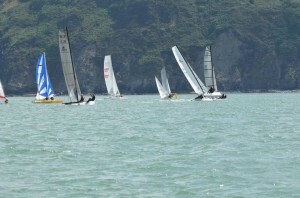 Good wind for a race! For those confident sailers without a boat, the club Dart 16s are available to borrow by members for a £10 fee (book via Facebook, paid up members only). 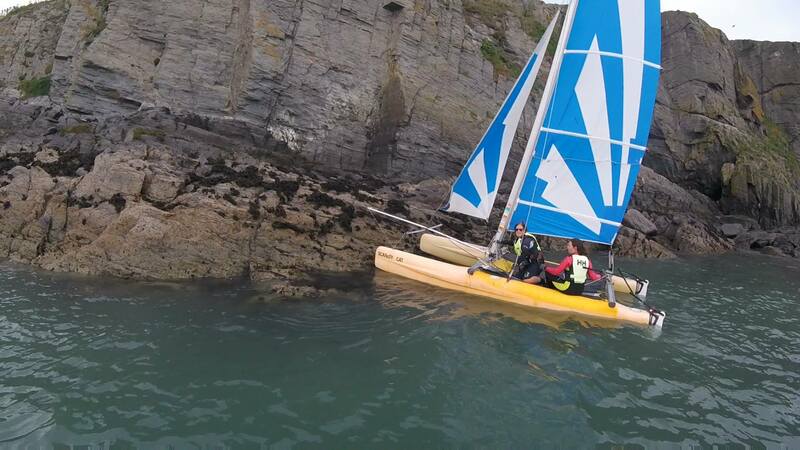 We have also got three new RS Feva dinghies, which will also be available for hire (£10 fee – these are a junior/youth doubled handed boat with optional asymmetric spinnaker) and have increased the number of Toppers we have available (£5 fee). Racing normally aims to start at 10 (summer) or 11am (spring/autumn) for the first race, with several held back to back depending on the wind. Aim to be on the beach for 8:30 (summer) or 9:30am (spring/autumn) to get rigged and ready, especially if you are borrowing a club boat and need help to rig. The planned TMSC Schedule for 2019 is below. Finer details will be added in due course but this schedule holds all the main items/events and races for the club in 2019. Any changes or cancellations due to wind etc will be posted on Facebook. Dates in red denote social or non sailing events – open to all. Dates in green denote Saturday sailing – these are generally fun social sails where we may sail along the coast, do some swimming, find fish and chips or maybe even a beer or are a special fun race (see below). Suitable for all sailors including beginners and families. Non sailors welcome to come along on the RIBs. Dates in purple are major weekend events. Blue is our standard open training for all ages and abilities. Often the dolphins come and join us somewhere along the way. Race from Tresaith, around Cardigan Island and back again. Which way round you go is up to you and your tactics, just try not to to park on the island! But I saw a seal! Refreshments available on the beach after sailing. All welcome including visiting sailors! Racing over two days plus marquee with live bands, beer, food and family fun on the beach. Classes for cats and dinghies. Yacht race from New Quay to Tresaith with boat taxi provided on Tresaith beach. 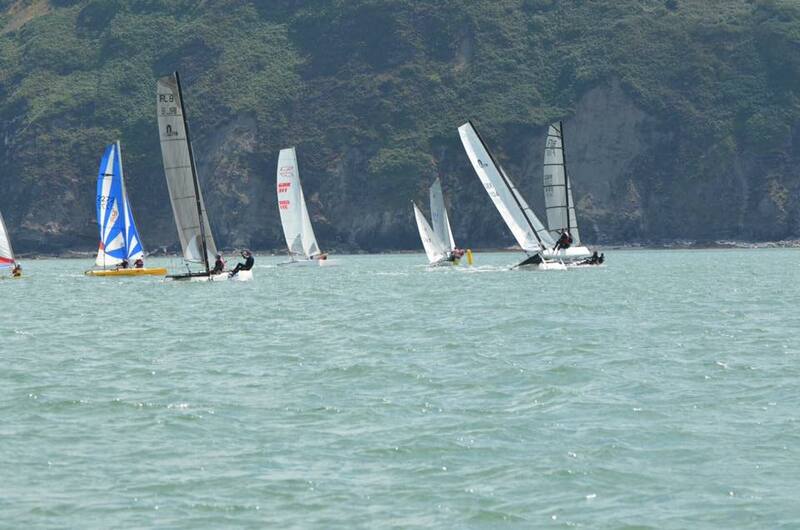 Tresaith Mariners are pleased to be hosting the F18 UK Nationals this year. There will be spectacular racing of these 18foot catamarans over three days plus marquee with live band Saturday night, beer, food and family fun (including sandcastle competition) on the beach. All races can be viewed from the beach and the cliffs. See the best of the UK and Ireland battle it out to be National champions. Beach party in the marquee FREE to all! Bar open all day till late & live band. Join our supporters email list.